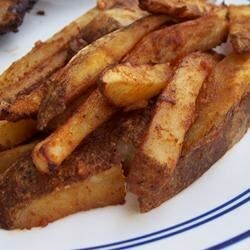 These spicy baked fries are very easy to make, and a great way to kick up your burger platter. Preheat an oven to 375 degrees F (190 degrees C). Grease a large baking sheet. Fill a large bowl with cold water, add the potatoes, and allow to soak for 10 minutes. Whisk together the oil, vegetable juice cocktail, chili powder, ground cumin, onion granules, garlic powder, cayenne pepper, sugar, and salt in a large bowl. Drain the potatoes, and pat dry with paper towels. Toss the potatoes with the oil and spice mixture; stir until evenly coated. Arrange fries in a single layer on the prepared baking sheet. Bake fries in preheated oven for 20 minutes. Turn and continue to bake until browned and crispy, about 20 additional minutes.